Does the darkness cloaking these twisting passageways hide ancient treasure or unimaginable horror? Paizo Publishing's latest Pathfinder Map Pack provides simple and elegant tools for the busy Game Master. These 5"x8" map tiles can be positioned to form a variety of mysterious underground tunnels, or combined with tiles from Pathfinder Map Pack: Cave Chambers to create an enormous earthen complex. Game Masters shouldn't waste their time sketching maps every time characters venture into a gloom-haunted cave mouth. 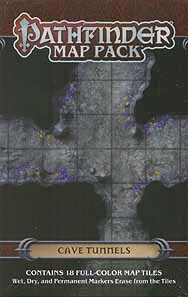 With Pathfinder Map Pack: Cave Tunnels, you;ll always be ready whenever adventurers journey beneath the earth.